Let’s face it: We are craving more and more storage space to backup all our videos and photos we keep capturing with our smartphones and cameras, but we’re also demanding that they be accessible from anywhere, and on any device. Traditional hard drives may give us a lot of space on the the cheap ($80 for a 1TB drive), but we’re also sending more and more files to cloud services like Dropbox and Google Drive that offer a lot less space for a lot more money than we’d like. For example, 1TB on Dropbox would cost us $800 per month for 5 users, according to Engadget. Consumers who just want to get a couple of movies onto the cloud so they can leave their Blu-ray disks at home, and be able to access those movie files as long as they can get online, should take a look at Space Monkey. It’s a new personal cloud subscription service that just launched on Kickstarter today. For just $10 per month (or $120 for the year), you get 1TB of storage on Space Monkey’s cloud, and won’t even have to pay a deposit for its shinny hardware, which is available in both black and white (as pictured). First year users will have to pay for a full year of service upfront, which is how the company has priced the different pledges on Kickstarter. For example, you can save $11 if you donate $109 to this project as an “After Early Bird” backer before this category sells out (the $100 “Early Bird” option is already all gone). If you change your mind about the service, the company will refund the unused months to you. According to its project page, transferring data between your computer and the Space Monkey cloud will be 15-60 times faster than on services like Dropbox and iCloud, thanks to the included hardware that will automatically duplicate your content in the cloud. Underneath the device’s curvy shell and awesome logo is actually a 2TB drive, where 1TB is completely yours to fill, while the other terabyte is off-limits for your personal use (we explain below). What’s innovative about Space Monkey is not so much its affordable price, but how it handles your data. Unlike a traditional cloud service that sends your files to a single datacenter with rows and rows of servers, your content will be chopped up into tiny, encrypted pieces and stored on other Space Monkey devices – hence the 1TB of space on the hard drive that you won’t have access to. The company is basically taking a page from the Internet and applying the same principle to cloud storage. What this means is that every little shinny Space Monkey box will be doubling as its distributed datacenter. As a result, Space Monkey can offer significantly lower prices to users as the company doesn’t have the sky-high costs of running a server farm – users are powering the storage devices. 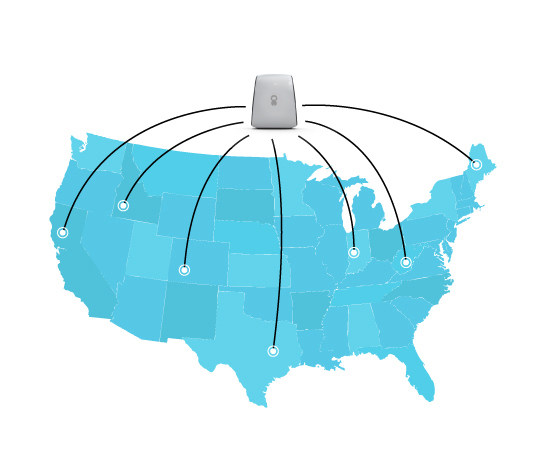 Because your data will be duplicated and stored across the country, you’ll still be able to access your content even if parts of the network is down, like during Hurricane Sandy. Some of the hurdles that Space Monkey will have to overcome include convincing potential backers and users that storing parts of your content on some other user’s device will be safe, since each piece of data will be protected by industry standard Advanced Encryption Standard (AES). After all, will we be able to trust that other Space Monkey users won’t try to hack your files, assuming they can crack the encryption? Since the network will only be as good as the number of subscribers Space Monkey can sign up, we wonder what the service will be like as its network grows. We imagine the quick data transfer speeds the company claims on its project page is only possible when there are many Space Monkey users available, just like with peer-to-peer sites. 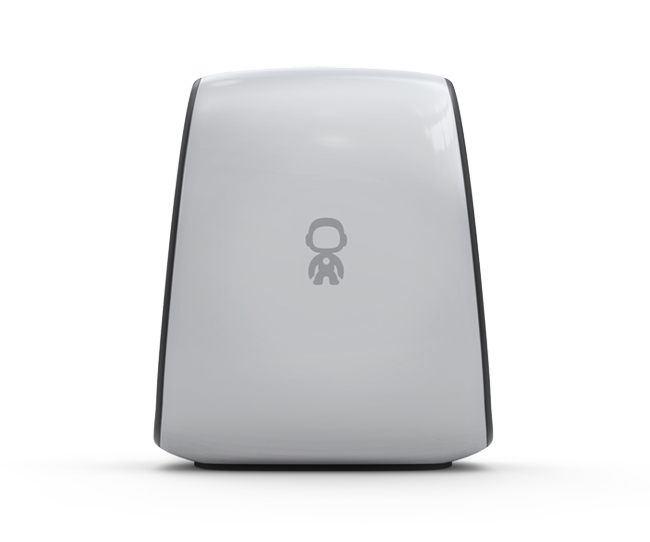 If you want to get in on this interesting cloud storage experiment from the ground floor, you can show your support for the project by pledging as much as $5,000 to receive a custom design Space Monkey device by May 17. Given that Space Monkey has already met its funding goal of $100,000 on its very first day (it has already raised over $175,000), you can be pretty confident that you’ll be getting a Space Monkey in the mail soon.